OK I admit it Im a Legendary Collection 2 Junky. Ive been making deck after deck trying to exploit the collection as much as I can. From Air Neos OTKs to Destiny Dragoon builds. OK some are not fully competitive but hey you can tell from most of my posts Im more into the fun game play than playing only whats gonna win me a jump. At least in my spare time. Where this line between fun and competitive blurs though is with my bubble beat build. It takes all the fun of heroes with the fusion monsters mixes in some explosive game play and has answers to most of the top decks being played right now. I especially like how for the first time I can run a hero build and have cards other than fusion monsters in my extra deck. True you may have run some synchs in there before in the past but this deck really touches on a more balanced extra deck utilizing XYZ monsters just as it does fusions if not more. Alius gives u access to Hero Blast (a trap that lets you target neo alius in the grave; add it to your hand, then destroy 1 face-up monster your opponent controls with less than or equal to 1900 attack. He's extremely searchable with ECall, ROTA, Stratos and Not to mention the access to the assortment of Hero Fusion monsters with Super Poly and Miracle Fusion. 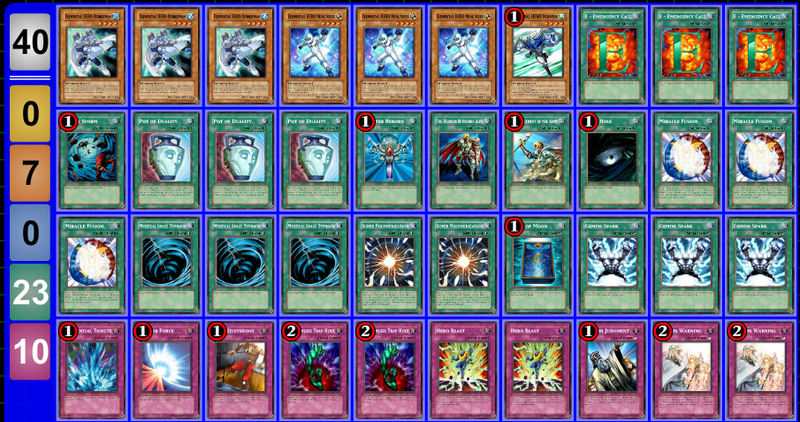 But if you want a deck review on hero beat or elemental heroes in general go google it. When a Level 5 or higher monster would be Special Summoned: You can detach 1 Xyz Material from this card; negate the Special Summon and destroy it. Forget the draw effect if you can pull it of and use it to save ur but thats great but what we are really after is a special summonable, level 4 warrior, that is hella searchable, a water target for absolute zero, and with out any once per turn restrictions. The basic play is to summon a level 4 monster, then with only bubbleman in hand special summon Bubbleman to then XYZ for a rank 4 or fuse into a Elemental HERO fusion monster. The second and most basic combo is to summon Stratos, grab Bubbleman from the deck, set your hand so you can special summon Bubbleman to then XYZ for a rank 4 or fuse into a Elemental HERO fusion monster. In the absence of Stratos you can also summon a level 4, use E-Call or Rota to grab Bubbleman, set your hand and special summon Bubbleman to then XYZ for a rank 4 or fuse into a Elemental HERO fusion monster. These 3 core combos can interact together as well to perform more complex plays. Since a lot of your spells are normal spells they can be set to let Bubbleman special himself and still be used the same turn. allowing you to swarm the field with XYZ and Fusion monsters. To reach 8000 attack points all you need is 2 Blade Armor Ninjas that have used their effects to attack 2x. And the fact that you are using XYZ monsters solves the Dimensional Fissure issue with Miracle Fusion since detaching the materials still sends them to the grave. Elemental HERO Escuridao will finally let you super poly almost everything and let you miracle with BAN or Roach.